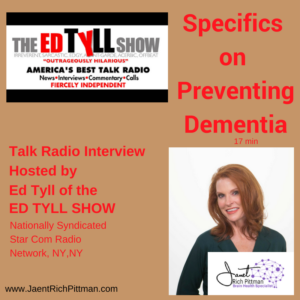 Star Com Radio Network, The Ed Tyll Show, 17 minutes: The basics for preventing dementia was on Ed’s mind as he hosted The Brain Nerd on his nationally syndicated show. Enjoy listening to our conversation [17 Minutes] (Or you can read the transcript below but you feel the energy, are up-riveted by the hope and laugh at how we carry on–words cannot give that to you). Let me know if you have any questions. Ed: Published in the Scientific American is an update on how we’re doing with Alzheimer’s and dementia and the headline on the report is Preventing Dementia, new report says not much is proved to work. We welcome our guest who knows a lot about the subject, Janet Rich Pittman. I believe there is reason for hope, right? Janet: Oh, absolutely. Hello, Ed, it’s good to be with you today. Ed: Same here. Welcome to the show. It’s a tough area but, you know, if you don’t get close enough to the information, you might be discouraged here. You have, I think, some good news for us today, how people can help keep their declining memory? Janet: Oh, absolutely, I mean that’s what I am. They call me the brain nerd, but really I’m a dementia prevention specialist and I just travel all around and speak on how to have a healthy brain. And if you have a healthy brain, that’s the way you prevent dementia. Ed: You know, dementia was around long before the term Alzheimer’s was in the vernacular and everybody understood what it was. Is dementia a condition separate from what leads to it or does every degenerative condition like this have its own type of dementia? What does dementia mean in lay terms…in the layman terms? Janet: Yeah, every dementia is different and dementia is, number one, is the massive killing of brain cells in a certain section of your brain on a quick amount of time. Now if you’re in your 60s or 70s, quick is 5, 10, 15, even 20 years but there are a number of types of dementia. And so, dementia is the overall umbrella if you will, just the death of brain cells causing your cognizance to leave you, causing your mind to leave you, your functioning, brain functioning to leave. Now there are different types of dementia and Alzheimer’s is the majority of the dementia diseases. Parkinson’s is a dementia, AIDs is a dementia, Huntington’s Disease is a dementia. So again, dementia is just a death of brain cells. Ed: Okay and are brain cells, when they are destroyed from dementia as far as we know, unable to be repaired, is this a part of the body that doesn’t regenerate? Janet: The brain is incredibly productive and we didn’t know until about eight years ago that we can create a new brain cells and it’s called neurogenesis. And so basically, these new brain cells are neurons and the way to create neurons is, the only proven way that has been studied is that, to create new neurons, you have to aerobically exercise that…that it invigorates your stem cells to produce these neurons. They have to be joggled, you know, to be created. And so aerobic exercise, when you force abnormal amounts of oxygen deep up into the piths of your brain and you get your cells working and activated and it jiggles your neurons to rejuvenate. And so that’s a wonderful way to create your brain cells, exercising, it’s called neurogenesis. But the trouble Ed, is that unless you do something with these neurons, they’re gonna shrivel, these new baby neuron and when I say do something, you’ve got to connect them to older neurons. And unless you connect them to older neurons, these baby neurons are gonna shrivel way and die. So the way you connect them to the new neuron is you have to learn something new. You have to have a mental accomplishment. And so that’s kind of the aspect of how we recreate brain cells. Ed: All right, I hear an analogy in there, so maybe you’ll agree with this. If you have a beautiful car and you never take it for a ride, then the car is gonna begin to not perform so well. But if you take that thing out every Sunday and take it for a ride and keep the oil fresh and, you know, keep it moving and working, that car is gonna go on forever. If you don’t use it, you lose it, is the old expression right? Janet: Absolutely, absolutely, absolutely, absolutely. You’re right on target. And that’s how you prevent dementia, as you keep using your brain and you exercise and keep producing those new neurons. Ed: Now see, this is to me very provocative because when I was a kid and your grandfather got old or your auntie, your uncle got old, everybody started catering to the lack of activity. You know, get a chair for grandpa, put him there for Thanksgiving and, you know, bring everything to him and, you know, this approach toward old age was exactly the opposite of what we’re talking about here. Engage, stay active, and you start getting those stem cells working up there, right? Janet: That’s exactly right. You’ve got to aerobically exercise your body and here’s the key though, Ed. You’ve got to do it, I mean, you know, aging is like when you do exercise, maybe a couple of times a week, that’s like taking one step forward, but yet aging pushes us two steps back, right? We’ve got to be above the fold. So you need to exercise every day. I mean six days a week at least, you can take a day off, but six days a week, you’ve got to aerobically exercise. And you can’t just take a walk through the rose garden. You’ve got to really get some power walking in there and huffing and puffing, get that energy, get that blood full of nutrients pushed up into the piths of your brain. Ed: Absolutely. Now on the cognitive side, is this kind of a corollary that, you know, grab a book, read something deep, watch a documentary about something you know nothing about. There’s lots of ways to get that brain moving, right? Janet: Absolutely, and here’s another key though, Ed. Just reading a Harlequin Romance or reading a newspaper, doesn’t cut it. You’ve got to accomplish something in your mind. You’ve got to…you got to answer questions. You’ve got to figure something out. The current events of keeping up with the Joneses, that just doesn’t work. You’ve got to read a mystery. You’ve got to figure out why Mobile, Alabama saved the War of 1812. You’ve got to come up with an answer. Ed: You know, when I’m hearing you say this, there’s a parallel here to when kids are small and you don’t want kids to be idle and you don’t want them to be staring at a television all day. You want them up, moving around, you know, going out exploring the world. So at both ends of human development, it is key to incite this kind of activity in the brain and as you say, it’s got to be engaging, it’s got to be something you’re all in on, right? Janet: Exactly and that’s why people say, “Oh, I’m gonna retire in a few months,” and I’m like, “Oh my gosh, are you kidding? You can’t retire, never retire.” Because what happens is, Ed, you know this, when the majority of the people who retire, well they turn off their brain as well, they turn off their body and their brain. And I just suggest to people never to quit working. Now you can change jobs, right? My sister says, she is a district attorney for our county and she says, “When I retire, I’m gonna go work for a florist. At least I’m gonna be busy, you know, I’m gonna keep up with doing what I love to do.” So that’s the key, you got to always keep going. Ed: You know, I have an aunt, you will love this story. She just turned 80 years old and she works in a jewelry store five days a week and she loves going to work. She has no plans of stopping at all and here’s the kicker, she’s the number one salesperson on the floor at the age of 80. Janet: I mean why. Ed? Because she cares about her customers and she keeps up with them and she’s like she remembers that they bought that diamond ring for the 25th anniversary and they come in again and they’re needing something else and she’s like, “I think your wife would like this.” You see, she’s continually working her brain. She’s continually figuring out something and she has a connection and that’s the next thing that’s so important about preventing dementia. You have to be connected to something. Your aunt is connected to the jewelry store and to her clients. And so you need to have something that you’re connected to whether that’s a grandchild getting them through algebra because he’s failing and you got to get a tutor for him or you, Ed, connected should get in the word out to the people. You’ve got to have a connection. Ed: Yeah, the human connection is so important. Again, I have another aunt who’s 94, who was telling me earlier today exactly that, she still loves when her granddaughter comes over and her granddaughter is stuck on something. She has the biggest great time of her life answering questions for this kid and it makes her entire day. It’s really that we need to get this word out because there’s so much downer and bummer and hopelessness transmitted by the mainstream media. There’s much more to this. I’m on the website thebrainnerd.com, terrific site you have there, www.thebrainnerd.com. And I see that you have top 10 brain exercises from everyday tasks. Can you talk about what these exercises do? Janet: Well, it’s like we were talking about earlier, when you have to accomplish something. You have to get to the end of something. So that’s gonna be doing something with a purpose. A main little exercise from every task is, do something…most of us are right-handed. Only 10% of the American population are left-handed. So those of you, who are left-handed, use your right hand and those of you who are right-handed, use your left hand. Stir the pot, cook, do everything with your left hand, many of your daily activities, try to conduct those with your left hand. Rearrange the furniture in your house. You know, we get into a routine, well, break your routine. Instead of coming back and forth from the grocery the same way every day, every time you go the grocery, come and go at a different way, a different direction. Just challenging, little challenges like that are what stimulate and keep your brain popping and stirring and moving and motivated to create new brain cells to connect…to connect those brain cells. Ed: Our guest knows a lot about the brain, Janet Rich Pittman, and the website as I just mentioned, thebrainnerd.com. 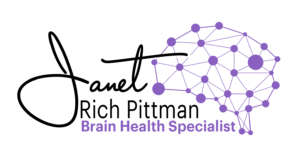 I’m on the site right now and you have something that you call “The Brain Health Revolution.” It really is revolutionary because I’m not hearing this coming out of any other quarters. Tell me about what happens with the free membership on your website? Janet: Well, I just send out information a couple of times a month and it just would help you understand how to have a good brain. I was talking to some girlfriends of mine and they’re like well, “What is brain health? I don’t know what that is? I mean, what is it?” I was like, “Well, you just got to energize the brain,” and you do that by exercising like we said and by eating right, you got to eat right and you got to physically exercise. We talked about aerobics but exercise your brain. And what we just talked about your aunt, both of your aunts, connecting, having a purpose in life. All four of those add up and consolidate into creating a very healthy brain. They’re all kind of stipulations though. You’ve also got to get to sleep and you’ve got that connection, you’ve got to concentrate. So I just send out information on how to have a healthy brain and that’s what the Brain Revolution is all about, how to have a healthy brain. Ed: You know, that my 80-year-old aunt took a trip with her daughter to Paris, had never been to France before, and we’re all like, “Oh my god, Aunt Florence is gonna Paris. Is she gonna fly” and all this stuff. All she did the entire time was laugh, smile, have the best…how important is travel and a change of scenery as a dementia prevention? Janet: Oh, Ed, it’s fabulous brain exercise. Okay, first of all, you’ve got to plan the trip, right? You’ve got to accomplish all these little things. Where am I gonna sit or how much is the airfare gonna be? Where are we going? What departure city are we going to go out of? I mean all of these little ramifications. What am I gonna wear? What time? How am I gonna get good sleep? You mean, you constantly you’re challenging the future. And so that’s the first part is planning the trip and figuring it out and getting there. Even interacting with the stewardesses and all the connoisseurs and the people at the hotel. That’s fabulous exercise because you’re learning new people and you’re learning something new and you’re putting yourself in a new environment. And all these wonderful travel opportunities and sightseeing arrangements and learn, that’s incredible, learning something new. You know, why am I sitting here? Why do I need to go to the Louvre? Who do I need to see at the Louvre? What’s gonna happen at the Louvre? What time? Am I gonna stand in line forever? How much is it gonna cost? Ed: Oh, you’re so good. Janet: This is fabulous brain exercises. Hats off to your aunt. Ed: You are so good. You are really a great evangelist for this and you bring us such hope today. There’s something on the website called The Brain Nerd Memory Series: IT’S THERE! 5 Simple Ways to Find Your Memory and Keep it. This is a series of five different books? Janet: Yes, they’re little short books. They each stand alone or they run together. They simultaneously come together. And it’s really, it’s not so much a nonfiction book. It’s a nonfiction on how to have a healthy brain and how to keep your memory inside a story, inside the fiction story. You know, people get so bored and lost in all this science, so I just put it into a fiction story, so people could be, “Oh my gosh, look what she’s doing. How is that happening? I see how that happens. Oh yeah, maybe I should think about that.” So it’s a fun way to get the word out. Ed: Janet, it’s the perfect season for everything that we’re talking about to get outside. Even Aunt Addie was getting out today at age 94, you’ve got to keep moving, you’ve got to keep thinking, you’ve got to keep learning. It’s such a great message. What do you derive your most joy from in the work that you do? Janet: What I’m doing right now, I’m meeting wonderful people like you, Ed, to help me get the word out. That’s what I love to do is just give people the information that they need to know to have a healthy brain, so that Alzheimer’s and other forms of dementia don’t come in and vacuum out their brains. You know, it’s not just about them either. It’s about their family and their friends. One person has what statistics say 2.5 children, well then they get married, okay, and they have four to six people and then have grandchildren, so that’s eight, then a husband. Ten people affected and then they’re not just affected, they are absolutely taken away. I mean they’re just nearly ruined by the Alzheimer’s or dementia vacuuming away their loved one. It’s just a tremendous problem and so just being able to educate people on how to have a healthy brain, so that hopefully this will not happen to them is what gives me pleasure. Thank YOU Ed. Ed: Well, I’ll tell you what, you give us hope and I am so grateful for that. You know, people talk about the political media and how negative it is and how not all the stories get reported. I think there’s some of that in this field of dementia. I don’t know that the media has focused enough on the upside because sometimes, you know, they just lean on the negative sides of stories. But you bring us hope, you bring us opportunity, and we’re so grateful to you for what you do and for visiting with us today and sharing some of this great feeling with our listeners across the country. Janet: Thank you for having me, Ed. It has been a pleasure to be with you. Ed: You bet, we will be sure and have you back because you’ve really put us in a whole different point of view today about dementia. Janet Rich Pittman is our guest. The website is thebrainnerd.com, Helping You Keep Your Memory. Thank you so much, Janet. We’ll talk again soon. It’s the Ed Tyll Show on Star Com Radio Network, AM/FM stations all across America. We’ll get you caught up on Wall Street and the close today. Also your news, weather, traffic, and sports.